TOHO 6/o Round-Orange/Blue/White Stripe Stock #: 6TL4-104-250 Now Lower Prices on all TOHO Wholesale Seed Beads! TOHO 6/o Round-Orange/Blue/White Stripe Stock # :6TL4-104-500 Now Lower Prices on all TOHO Wholesale Seed Beads! TOHO 6/o Round-Dark Blue/Light Blue Stripe Stock #: 6TL4-7-250 Now Lower Prices on all TOHO Wholesale Seed Beads! TOHO 6/o Round-Green/Red/White Stripe Stock #: 6TL4-105-250 Now Lower Prices on all TOHO Wholesale Seed Beads! TOHO 6/o Round-Red/Green/White Stripe Stock # :6TL4-105-500 Now Lower Prices on all TOHO Wholesale Seed Beads! TOHO 6/o Round-Red/White/Blue Stripe Stock #: 6TL4-106-250 Now Lower Prices on all TOHO Wholesale Seed Beads! TOHO 6/o Round-Red/White/Blue Stripe Stock #: 6TL4-106-500 Now Lower Prices on all TOHO Wholesale Seed Beads! TOHO 6/o Round-Ruby Transparent Stock # :6T5B-100 TOHO Factory Packaged in a 100 Gram Bag. TOHO 6/o Round-Garnet Transparent Stock # :6T5D-250 Now Lower Prices on TOHO Seed Beads! TOHO 6/o Round- Dark Green Transparent Stock # :6T7B-100 TOHO Factory Packaged in a 100 Gram Bag. TOHO 6/o Round-Blue Zircon Transparent Stock # :6T7BD-100 TOHO Factory Packaged in a 100 Gram Bag. TOHO 6/o Round-Cobalt Blue Transparent Stock # :6T8-100 TOHO Factory Packaged in a 100 Gram Bag. TOHO 6/o Round-Dark Cobalt Blue Transparent Stock # :6T8D-250 Now Lower Prices on all TOHO Wholesale Seed Beads! TOHO 6/o Round-Crystal Silver Lined Stock # :6T21-100 TOHO Factory Packaged in a 100 Gram Bag. TOHO 6/o Round-Dark Topaz Silver Lined Matte Stock # :6T22CF-250 Now Lower Prices on all TOHO Wholesale Seed Beads! TOHO 6/o Round-Light Aqua Silver Lined Stock # :6T23-100 TOHO Factory Packaged in a 100 Gram Bag. TOHO 6/o Round-Light Green Aqua Silver Lined - Stock# 6T23BDA-250 Now Lower Prices on all TOHO Wholesale Seed Beads! TOHO 6/o Round-Ruby Silver Lined Stock # :6T25B-100 TOHO Factory Packaged in a 100 Gram Bag. TOHO 6/o Round-Dark Ruby Silver Lined-Stock # :6T25C-100 TOHO Factory Packaged in a 100 Gram Bag. TOHO 6/o Round-Garnet Silver Lined Stock # :6T25D-250 Now Lower Prices on TOHO Seed Beads! TOHO 6/o Round-Kelly Green Silver Lined Stock #: 6T27-100 TOHO Factory Packaged in a 100 Gram Bag. TOHO 6/o Round-Cobalt Blue Silver Lined Stock # :6T28-100 TOHO Factory Packaged in a 100 Gram Bag. TOHO 6/o Round-Dark Cobalt Silver Lined Stock # :6T28D-250 Now Lower Prices on TOHO Seed Beads! TOHO 6/o Round-Light Black Diamond Silver Lined Stock # :6T29-100 TOHO Factory Packaged in a 100 Gram Bag. TOHO 6/o Round-Black Diamond Silver Lined Stock # :6T29B-100 TOHO Factory Packaged in a 100 Gram Bag. TOHO 6/o Round-Light Pink Silver Lined Stock # : 6T31-100 TOHO Factory Packaged in a 100 Gram Bag. TOHO 6/o Round-Sapphire Silver Lined Stock # :6T35-100 TOHO Factory Packaged in a 100 Gram Bag. 6/o Round-Emerald Green Silver Lined Stock # :6T36-250 Now Lower Prices on TOHO Seed Beads! TOHO 6/o Round-Olivine Silver Lined Stock # :6T37-250 Now Lower Prices on TOHO Seed Beads! TOHO 6/o Round-Light Purple Silver Lined Stock # :6T39-100 TOHO Factory Packaged in a 100 Gram Bag. TOHO 6/o Round-White Opaque Stock # :6T41-100 TOHO Factory Packaged in a 100 Gram Bag. TOHO 6/o Round-Medium Blue Opaque Stock #: 6T43D-100 TOHO Factory Packaged in a 100 Gram Bag. TOHO 6/o Round-Red Opaque Stock # :6T45-100 TOHO Factory Packaged in a 100 Gram Bag. TOHO 6/o Round-Light Red Opaque Stock #: 6T45A-100 TOHO Factory Packaged in a 100 Gram Bag. TOHO 6/o Round-Dark Brown Opaque Stock # :6T46-100 TOHO Factory Packaged in a 100 Gram Bag. TOHO 6/o Round-Terra Cotta Opaque, Stock # 6T46L-250 Now Lower Prices on TOHO Seed Beads! TOHO 6/o Round-Dark Royal Blue Opaque Stock # :6T48-100 TOHO Factory Packaged in a 100 Gram Bag. TOHO 6/o Round-Jet Black Opaque Stock # :6T49-100 TOHO Factory Packaged in a 100 Gram Bag. TOHO 6/o Round-Cream Opaque Stock # :6T51-100 TOHO Factory Packaged in a 100 Gram Bag. TOHO 6/o Round-Hematite Metallic Stock # :6T81-100 TOHO Factory Packaged in a 100 Gram Bag. TOHO 6/o Round-Navy Blue Iris Metallic Stock # :6T82-100 TOHO Factory Packaged in a 100 Gram Bag. TOHO 6/o Round-Olive Brown Iris Metallic Stock # :6T83-100 TOHO Factory Packaged in a 100 Gram Bag. TOHO 6/o Round-Green Iris Metallic Stock # 6T84-100 TOHO Factory Packaged in a 100 Gram Bag. TOHO 6/o Round-Purple Iris Metallic Stock # :6T85-100 TOHO Factory Packaged in a 100 Gram Bag. TOHO 6/o Round-Jet Black Iris Metallic Stock # :6T86-100 TOHO Factory Packaged in a 100 Gram Bag. TOHO 6/o Round-Blue Iris Metallic Stock # : 6T88-100 TOHO Factory Packaged in a 100 Gram Bag. TOHO 6/o Round-Dark Purple Iris Metallic Stock # : 6T90-100 TOHO Factory Packaged in a 100 Gram Bag. TOHO 6/o Round-White Opaque Luster Stock #: 6T121-100 TOHO Factory Packaged in a 100 Gram Bag. TOHO 6/o Round-Light Cream Opaque Luster Stock #: 6T122-100 TOHO Factory Packaged in a 100 Gram Bag. TOHO 6/o Round-Turquoise Opaque Luster Stock #: 6T132-100 TOHO Factory Packaged in a 100 Gram Bag. TOHO 6/o Round-Crystal Transparent Rainbow Stock # :6T161-100 TOHO Factory Packaged in a 100 Gram Bag. TOHO 6/o Round-Dark Green Lined Topaz Matte Stock # :6T242FM-250 Now Lower Prices on TOHO Seed Beads! TOHO 6/o Round-Yellow Lined Light Olive Rainbow Stock # :6T246-100 Now Lower Prices on TOHO Seed Beads! 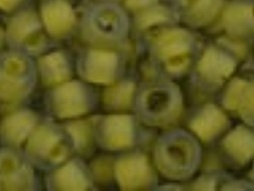 TOHO 6/o Round-Yellow Lined Light Olive Rainbow Matte Stock # :6T246FM-250 Now Lower Prices on TOHO Seed Beads! TOHO 6/o Round-Purple Lined Aqua Matte Stock # :6T252FM-250 Now Lower Prices on TOHO Seed Beads! TOHO 6/o Round-Lime Lined Jonquil Matte Stock # :6T306FM-250 Now Lower Prices on TOHO Seed Beads! TOHO 6/o Round-Peach Galvanized PermaFinish Stock # :6TPF551-100 PermaFinish is a protective finish for durability and stability of color. TOHO 6/o Round-Peach Galvanized Matte PermaFinish Stock # :6TPF551F-250 PermaFinish is a protective finish for durability and stability of color. TOHO 6/o Round-Peach Galvanized Matte PermaFinish Stock # :6TPF551F-100 PermaFinish is a protective finish for durability and stability of color. TOHO 6/o Round-Gold Galvanized PermaFinish Stock # :6TPF557-100 PermaFinish is a protective finish for durability and stability of color.